"Syncline" by Albert Paley was the sculpture recommended by the Public Art Commission to the Breckenridge town council. The council agreed none of the four finalists were right for the roundabout, though they want to purchase Paley's sculpture for another location. Breckenridge is wiping the slate clean, starting a new search for a sculpture in the roundabout at the north entrance of town. The town council on March 11 rejected all four finalist designs, after the Breckenridge Public Art Commission selected “Syncline,” by Albert Paley, as its top recommendation. The other finalists included “Dreams and Gravity,” by Ilan Averbuch; “Mountain Embrance,” by Denny Haskew; and “Summit Gold,” by Seth Vandable. The art commission received 260 responses to its initial call to artists, posted in October 2013. “I don’t think any one of the four pieces are appropriate for the roundabout coming into town,” Councilman Gary Gallagher said. Jennifer Cram, arts district manager, said “Syncline” was chosen because the commission felt it best met the creative intent requirements, and people would come to Breckenridge to see the piece because Paley is a well-known artist. All seven council members agreed not to move forward with the proposed designs, mainly responding to negative public feedback about the choices. 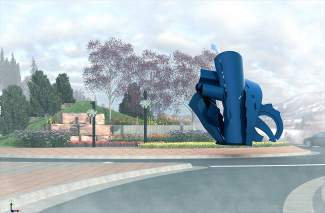 However, the council agreed to purchase the Paley sculpture and place it in a different location, providing the necessary funds to continue the search process for a roundabout piece. “I’d like to see a process that results with a consensus between the art commission and the community,” Councilman Ben Brewer said. The commission reviewed applications in December 2013 and narrowed the field to the four finalists. Those artists prepared proposals and scale models to show the commission and public on Feb. 19. At the March 5 art commission meeting, the nine members discussed the finalists and selected the Paley piece to recommend to the town council. Gallagher said he appreciated the recommendation and hard work of the art commission, and understood how a piece like Paley’s could bring visitors and art enthusiasts to town, but thought the piece should be viewed up close, with people getting the chance to walk around it and read more about the artist and the piece itself. He suggested placing it near the Riverwalk Center or another area downtown. A majority of the public, both online at EngageBreckenridge.com and at the public presentation, voted for Vandable’s piece showing a skier, but the feedback overwhelmingly noted none of the four seemed to represent the town. But Councilwoman Wendy Wolfe said she heard loud and clear the public did not want to see any of the four final designs. While the council did agree the Paley piece had the correct sense of scale, Councilwoman Jennifer McAtamney questioned whether the roundabout was even the right place for an entrance sculpture. Cram was unable to reach Paley on March 12 to see if he was receptive to having his sculpture purchased by the town for another location. The art commission will hold a special meeting next week, then return to town council March 25 to seek more direction on how to proceed. Cram said it can be challenging to find art the public can relate to while having the piece be meaningful for the location and to the town’s collection.